Don't let the high price tag of plastic surgery stop you from getting rid of those unwanted blemishes- Plasma Fibroblast Skin Tightening may be the procedure for you! INTRODUCING FIBROBLAST SKIN TIGHTENING AT BROWS & BEYOND! Plasma Firbroblast Skin Tightening is the only cosmetic treatment to use plasma to eliminate excess skin. Low risk, moderate downtime and more affordable then surgery. Plasma Fibroblast Skin Tightening is known for it’s success with Non Surgical Eye lift, Skin Tag Removal, Tummy Tightening, Stretch Marks and so much more. Plasma Fibroblast Skin Tightening is the latest in Non-invasive surgery. Eliminate unwanted problem areas in the skin like: Double Chin, Forehead Lines, Wrinkles, Crows Feet & much more! Get a tummy lift without all the hassle! Tighten your neck region with our neck tighting procedures. *prices vary depending on the size of the area treated. Give us your Name & Email- We'll get back to you with the earliest dates! Eyelid tightening, including lower eyelids & excess upper eyelid skin. Plasma Face lift and Plasma Neck lift. The term “Soft Surgery” is used to describe the treatment because it delivers results similar to surgery, with no scalpel, stitches or bandages and moderate downtime. A minimally invasive procedure with much lower risk and at a more affordable price then actual surgery. The Plasma Fibroblast Skin Tightening method has many advantages over cosmetic surgery, which makes it an increasingly popular treatment. There is no cutting of the skin, which means that there are no stitches required, and clients can return to work much sooner. The number of treatments required will vary according to the condition being treated, skin’s laxity, the desired degree of correction and the individual’s response to the treatment. Most clients see results instantly and this continues to improve over the course of the following 8 weeks. Further treatments can be carried out to get better results, although it is uncommon to require more than two treatments. Appointments must be spaced out by 8 weeks. Plasma Fibroblast Skin Tightening has been shown to be a safe treatment due to its non-invasive nature. Still the majority of clients are likely to experience some minor side effects in the 7-10 days following treatment. Is There Any Swelling After? Some, swelling will be seen (especially in cases of eyelid treatment), but it is likely to only last 3-5 days at most. Swelling in the eye area is to be expected for a few days following an upper eyelid treatment. Can I Get Fibroblast Treatment During Pregnacy? Plasma Fibroblast Skin Tightening treatment should not be used on women who are pregnant or breast feeding. Although some darker skin types are suitable for the soft surgery procedure, it is not advised for those with darker pigmented skin. This is because there is a higher risk of hyperpigmentation (dark spots) or hypopigmentation (light spots) following treatment. 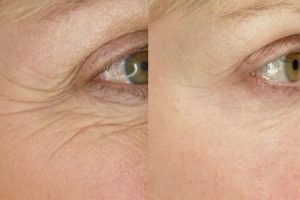 Plasma Fibroblast Skin Tightening is more than a simple tightening treatment, skin is actually removed, so the effects should last as long as they would with invasive surgery. The positive effects of treatment will be noticeable immediately after the first treatment, but the best results will be seen after 4 weeks.